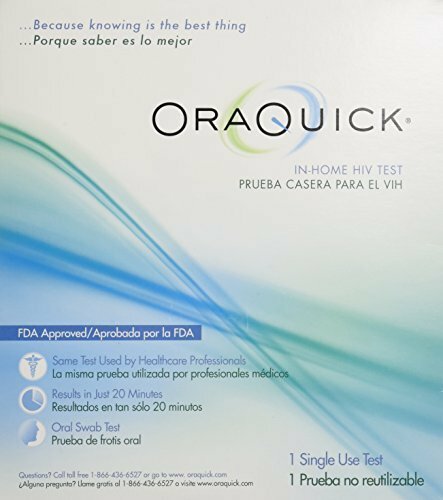 Oraquick HIV Test in Home. With OraQuick, you have the comfort of getting your test results in the privacy of your own home. It's the only at-home oral HIV test approved by the FDA. Trusted: The same test healthcare professionals use. Fast: Results in 20 minutes. Oral: (no blood required) Just a quick oral swab application. Confidential: 24/7 call-center support. Safe and Effective: FDA approved. 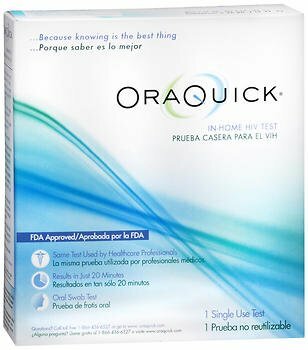 Oraquick is the same test doctors have relied on for years. Now available from the privacy of your own home. 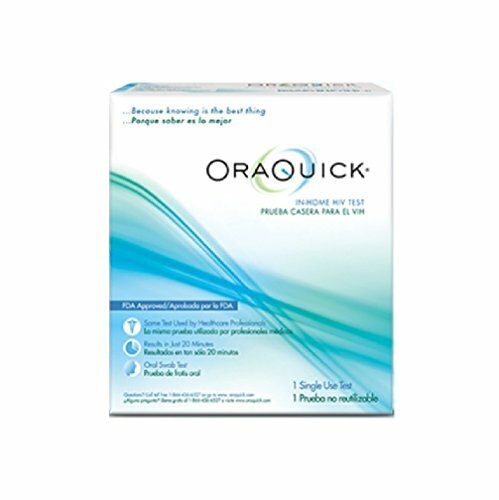 Oraquick is a FDA approved oral swab, so there's no blood. Get your results at home in just 20 minutes!!!! Includes 24/7call center support and is 100%private. 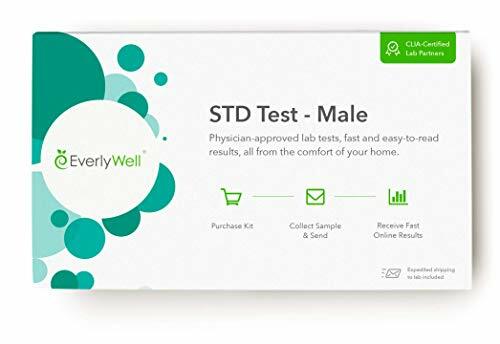 This at-home STD Test will check for 7 sexually transmitted infections that could harm you if left undiagnosed and untreated, all from the privacy of home. It tests for gonorrhea, syphilis, hepatitis C, HIV, herpes type 2, chlamydia, and trichomoniasis. This is a physician approved-lab test that delivers you fast and easy-to-read results directly to your device, completed from the comfort of your home. If you receive your results and test positive, we offer our customers free phone consultation with a physician who can write you a prescription in 34 states - for Chlamydia, Gonorrhea, Trichomoniasis, or Herpes Type 2. The men's sexual health test requires two samples - blood spot and urine. If you receive your results and test positive, we offer our customers free phone consultation with a physician who can write you a prescription in 34 states - for Chlamydia, Gonorrhea, Trichomoniasis, or Herpes Type 2. You will receive your results through an easy-to-understand report on our secure online platform within days. Includes a free consultation with a physician and prescriptions written over the phone where applicable. KITS NOT PERMITTED FOR USE IN MD, NY, NJ, RI. Can detect HIV infection if used 3 months after a resk event. Easy to use, fast convenient results in the privacy of your home. An in-vitro diagnostic home-use test for HIV (HIV-1 and HIV-2) in oral fluid. Most people assume that blood is involved in HIV testing. But with OraQuick an oral swab is used for testing and requires no blood. By collecting oral fluid from your gums, you collect fluid similar to that used in blood testing. So the OraQuick Test detects antibodies for HIV, not the virus itself. You just gently swipe the test swab along your upper gums once and your lower gums once. Then you insert the swab inside the test tube provided and get your results in just 20 minutes. 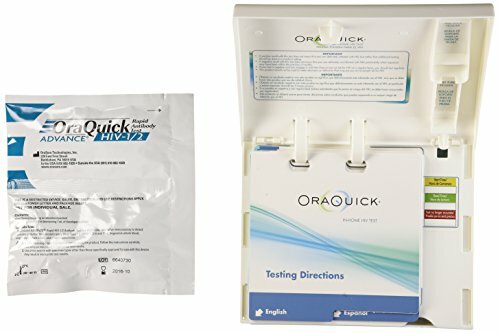 Safe and approved by the FDA for use by adults (17 years of age or older), OraQuick is the first and only HIV test that delivers your results with all the comforts and privacy. For forensic use only. Not cleared by the FDA. 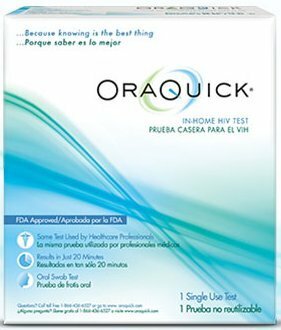 Oraquick HIV Test in Home. With OraQuick, you have the comfort of getting your test results in the privacy of your own home. It's the only at-home oral HIV test approved by the FDA.Trusted: The same test healthcare professionals use.Fast: Results in 20 minutes.Oral: (no blood required) Just a quick oral swab application. Confidential: 24/7 call-center support. Safe & Effective: FDA approved. Includes 2 single use tests. 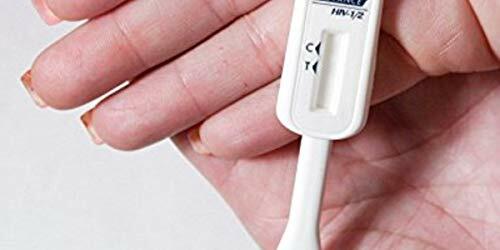 ANTI-HIV1+2 Test is a rapid direct binding screening test for the presence of antibodies to HIV 1 and HIV2.The test is based on the principle of double antigen sandwich immunoassay for the qualitative detection of Anti-HIV in human serum. Purified recombinant antigens are employed to identify Anti-HIV specifically. This one step test is very sensitive and only takes about 15 minutes. Test results are read visually without any instrumentation. identify Anti-HIV specifically. This one step test is very sensitive and only takes about 15 minutes. Test results are read visually without any instrumentation. Results in 15 mins. 100% Private. myLAB Box's HIV test for Women tests for both HIV-I and HIV-2. Your test kit will ship within 24 hours of purchase and provides the same accuracy of testing you would receive in a doctor's office. Your myLAB Box includes: a blood drop collection kit (finger prick), easy to follow instructions, and a postage paid return box to mail in your samples. Register and login to our system to easily review results online with myLAB Box's secure and private HIPAA-compliant testing and reporting. If you should happen to test positive and would like professional guidance, myLAB Box can connect you to real physicians in your state free of charge for phone consultations. With quick, in home STD testing and accurate results, you can take charge of your sexual health with myLAB Box. Get tested. Know your status. Reduce your risk. Express HIV-1 Test How it Works Besides being fast, convenient and accurate, the Home Access HIV-1 Test System is easy to use. 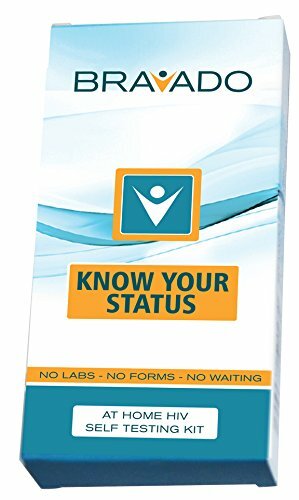 Each test kit comes with a detailed instructions booklet with illustrations which will take you through pre-test registration and counseling; collecting a blood sample; shipping that sample to our accredited laboratory and calling back for test results, post-test counseling and referrals. Throughout the testing process, professionally trained counselors are available to provide assistance and to answer your questions. To protect your privacy, you are identified only by your eleven-digit Home Access code number (which comes with the kit). Sample Collection Using the retractable safety lancet provided, you prick your fingertip and place drops of blood on the blood specimen card included in the test kit. You only need enough blood to fill a circle the size of a dime. Shipping Your blood sample is protected by an enclosed weather resistant protective pouch which is placed in a self-addressed, pre-paid FedEx or U.S. Mail shipping envelope, all included in the test kit. Your sample is shipped directly to our accredited laboratory. Laboratory Analysis The Home Access laboratory is FDA approved, CLIA (Clinical Laboratory Improvement Act) certified #14D0981820) and CAP (College of American Pathologists) accredited. Our procedures and protocols have been certified by the United States Food and Drug Administration under cGMPs (Current Good Manufacturing Practices). At the laboratory, your blood sample is tested by experienced technicians using the exact same test ordered by doctors offices, hospitals and clinics, ensuring greater than 99.9% accuracy. 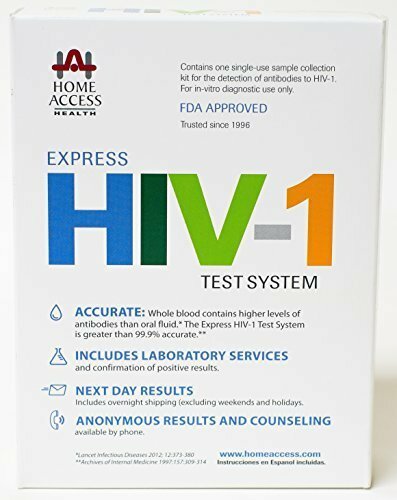 When Results are Available Results for the Home Access Express HIV-1 test are available the day the lab receives your blood sample (excluding weekends & holidays) after shipping. After receiving results by phone you may request a written copy of results by email or by U.S. Mail. myLAB Box's HIV test for Men tests for both HIV-I and HIV-2. Your test kit will ship within 24 hours of purchase and provides the same accuracy of testing you would receive in a doctor's office. 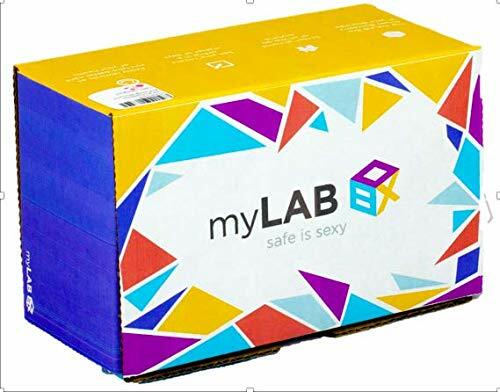 Your myLAB Box includes: a blood drop collection kit (finger prick), easy to follow instructions, and a postage paid return box to mail in your samples. Register and login to our system to easily review results online with myLAB Box's secure and private HIPAA-compliant testing and reporting. If you should happen to test positive and would like professional guidance, myLAB Box can connect you to real physicians in your state free of charge for phone consultations. With quick, in home STD testing and accurate results, you can take charge of your sexual health with myLAB Box. Get tested. Know your status. Reduce your risk. This kit tests for Chlamydia, Gonorrhea, Trich and HIV in women. What's included: - 1 test kit for Chlamydia, Gonorrhea and Trich (swab sample) - 1 HIV Test (finger blood prick sample) - 1 self-addressed stamped envelope for sending sample to our lab In the U.S., 1 in 3 people live with a viral STD today and 1 in 2 will be infected in their lifetime. We work with the top U.S. manufacturers to bring FDA-compliant STD screening kits to your doorstep in a discreet package. Tests can be self-administered in as little as 5 minutes. Simply mail in a small urine, swab or tiny blood prick sample in the self-addressed stamped envelope provided and receive lab-certified results back electronically in a matter of days. We make it that easy! How It Works It's simple - myLAB Box is your lab in a box. Our experts have designed a program that makes frequent STD screening easy and convenient so you can take control of your health with a click from the comfort of home at 1/2 the cost. Use it as often as you'd like - you are in charge! 1. Order a test online 2. Collect & mail your sample to our lab 3. Log in to view your results 4. Enjoy your privacy & peace of mind About Our Lab & Medical Experts Our CLIA High Complexity testing laboratory is certified in all 50 states, and has been at the forefront of infectious disease testing methodologies for a over a decade. Our health experts have years of experience in internal medicine and wellness, and will ensure your lab results are handled with care and meet nationwide health standards. Also Includes: Kama Sutra Massage Oils (59ml, set of five) Date of birth is required for chlamydia/gonorrhea and trich testing. This information is kept 100% private and is only used for lab requisition purposes.